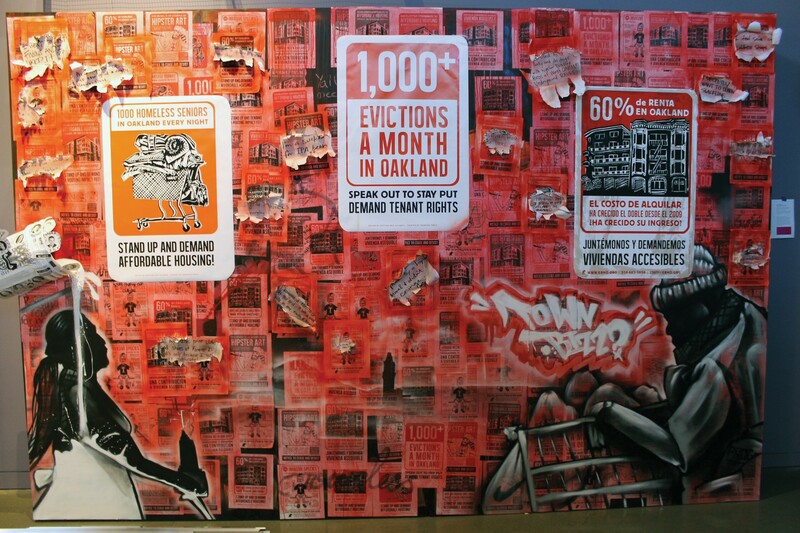 Exhibit amplifies the conversation around gentrification and asks viewers to participate. A photo by Julie Placensia. My bike ride from the Express office to the Oakland Museum of California last week started off in Jack London Square, a former warehouse district now home to high-end lofts. As I rode underneath the I-880, tents lined the underpass. Then, in Chinatown, vegetable markets filled the blocks between old Victorians. And, as I turned down Tenth Street, I passed multiple artist studios — a newer addition to the neighborhood. In total, the trip took about four minutes. Inside the museum, a replica of that same shifting landscape was being built. On July 23, the museum will open Oakland, I want you to know... a show that literally recreates an Oakland neighborhood to encourage dialogue about gentrification. OMCA's curator of Public Practice Evelyn Orantes teamed up with local artist Chris Treggiari (creator of the Eyes on Oakland project) to "guide" the exhibit — a verb used in the show's press materials, presumably because everything in the show is already happening outside the museum. It just needed a little help being guided into the gallery. The installation is a near-life-sized, theater-set model of West Oakland (only half completed when I saw it). It includes a Victorian house, complete with armchairs and wallpaper; a BART car stopped at West Oakland, with fluorescent lights seemingly identical to those on the actual train; an under-construction loft; a re-creation of Esther's Orbit Room, the famous, old Seventh Street jazz club; and a community garden sprouting with felt carrots. In the center, old Express boxes — which the museum requested — help create two bus stops in front of a few large billboards. The immersive installation isn't merely an exercise in set design. Rather, the walls are an elaborate method of installation for a show that's actually about social practice. As Orantes put it, the life-size diorama is "a stage for community voices." Each building is also a soap box for Oaklanders actively involved in the conversation around gentrification. The Victorian, for example, centers on community, neighborliness, and diversity, said Orantes. 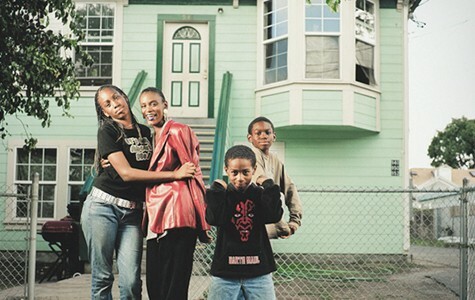 Inside, it features a grid of photographs by Julie Plasencia from a project in which she took portraits of all of the people who live in her West Oakland neighborhood — unsurprisingly, an incredibly diverse group. A shelf features around six hundred books made by Oakland middle schoolers that answer the question proposed in the show's title. Inside the loft, there's a series of diagrams that explain policies like redlining and other ways that city planning can work to intentionally create ghettoes. The jazz lounge houses interviews with Oakland art scene leaders advocating against their own erasure — such as Anyka Barber of Betti Ono and Jasman Records' James Moore. And in the community garden, there's info on food deserts and interviews about urban gardening that highlight the importance of keeping our communities healthy. But in the streets is where the action happens. One faux bus stop offers posters designed by local printmakers Michael Wertz and Querido Galdo that say "Oakland, I want you to know..." with a blank space at the bottom, intended for visitors to take away and plaster onto poles around the city. The other bus stop has a map of all the city council districts along with templates for letters to councilmembers, so that visitors can write down their concerns and drop them in the mailbox attached to the side. Orantes said that she'll be delivering all the letters directly. The exhibit attempts a difficult dance: It wants at once to be accessible to all ages, to tackle complex and urgent social issues, and to offer striking visuals. The end result may come off as a little gimmicky. But it shouldn't be dismissed as being just for middle-school tours. It's worth noting that it would be relatively straight-forward to curate a show about the loss of culture in San Francisco's Fillmore district, or how the SOMA neighborhood has changed over the last few decades. Because, in those neighborhoods, it's largely too late — that history is static. But Oakland, I want you to know... is not a processed reaction or a memorial; it's an exhibit unfolding in the present tense. It's a show that insists museums can do more than archive — that they can spark social change. Ultimately, though, the extent to which this is true will depend largely on whether Oaklanders show up and write letters, and whether councilmembers actually read them — whether Oakland is actually listening.